There are a number of reasons to transfer a domain name to another registrar. Perhaps your current registrar doesn’t offer all of the features you need, or they’re offered at a price that simply doesn’t fit your budget. Regardless of the reason you find yourself here, all the information you need to complete a domain name transfer can be found below. The process is simple and relatively quick. Read up on all the information provided below and you will be back to business as usual in no time. Online success starts with a great domain. Find yours today at Domain.com. 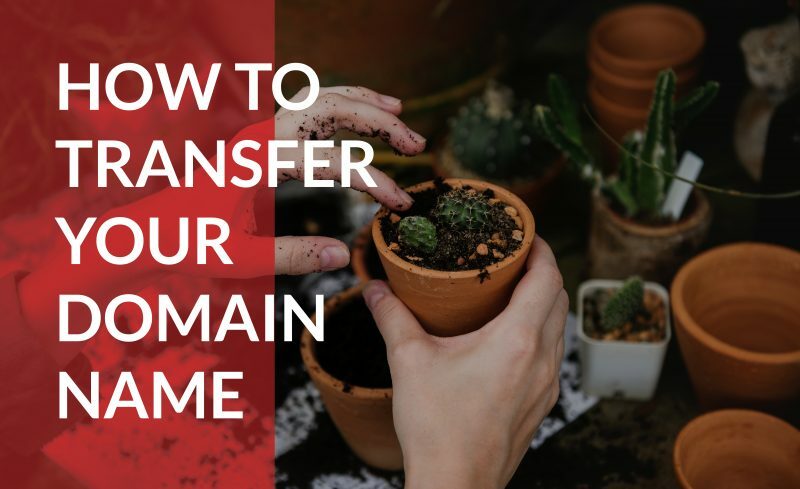 What does it mean to transfer a domain Name? Transferring a domain name means changing the registrar with which your domain name is registered. If you have already tracked down and purchased that perfect domain name for your business or project, but find yourself displeased with the level of service provided by your current registrar, don’t worry. Transferring your domain to a registrar that better suits your needs is a relatively simple process. Why do people transfer domain names? There are plenty of reasons one might become disgruntled with one’s current registrar and choose to switch to another. After all, not all registrars are created equal. Most will offer packages that include different features, with different prices and different levels of reliability. Some offer superior customer support, while other user interfaces are easier to navigate. Provider: It’s important to consider the source of the services and features offered by a given registrar. Some, like Domain.com, offer all of their own services with seamless integration—including email and web hosting. Other registrars may outsource some of these services to third-party providers and use clunky integrations that slow your business down. User friendliness: Ease of use is a primary concern when considering the purchase of any good or service, and domain name registration is no different. In this case, you will want to know that the features offered to you are simple to implement. Domain.com offers a number of user-friendly tools that make tasks like domain management simple for you. Other registrars may not offer these, which may require a significant amount of effort on your end. Customer support: As with any endeavor, it is possible that you will run into a hiccup and have questions that need answering. You want to know that there is someone available on the other end of the customer service line to answer your questions when you need them. We at domain.com pride ourselves on our ability to offer quality live support whenever you may need it. Every registrar has a different formula for pricing the services they offer. At Domain.com, our transfer fee includes a one year registration. Some offer all-inclusive services that may provide more bang for your buck, as all of the features you want are offered at a discounted rate. Others require you to purchase a base service at a lower rate, and then charge for additional features that you may still need. It is also possible that they offer a low price for the first year of service, only to charge more to renew. This kind of thing has been known to leave customers disgruntled, so be sure to check pricing structure to make sure that you are not being overcharged for services you want or need. If you are unhappy with the pricing structure of your current registrar, it may be time to make a change and start the transfer process. How long does it take to initiate a transfer? Here is a bit of good news for you: completing a domain name transfer does not take long at all. If you take the time to sit down and stay on top of it, the steps you need to take can be completed in an hour or two. We recommend the process be completed in one sitting, when possible, for security purposes. How long to complete the process? Once you have fulfilled all requirements on your end, the rest of the transfer process is completed in 5-7 business days, under normal circumstances. Domain.com is one of the leading registrars in the industry for a reason. We offer the ability to easily manage your domains from a single, user-friendly platform. We also offer a comprehensive set of features for all of your needs under a straightforward pricing structure, with fantastic customer service to boot. Domain.com lets you easily manage all of your existing domains by using our Dashboard. As the name suggests, it is a single user interface that allows you to manage all domains registered with us in one centralized location. There is no need to navigate between pages for each individual domain. If your domain name is operational, that means you have a host. Not only does Domain.com offer a plethora of hosting options, but we offer you the ability to manage both your domains and your hosting needs all in one place. This makes your experience seamless and convenient. As you probably already know, your claim on a domain name has an expiration date. In the likely event that you want to keep your domain name longer than the term specified during your original purchase, then you will need to renew your subscription. Otherwise, your claim will expire, and your domain will become available for purchase by another party. Domain.com offers an automatic domain renewal feature that helps you keep track of expiration dates, and gives you the option to renew automatically. Just set your profile to renew automatically, and Domain.com will take you through the process automatically when the time comes. Domain.com offers some of the most competitive pricing available in the industry. By offering features and services at competitive and affordable prices Domain.com is able to offer substantial savings over many of the other registrars around. Domain.com offers some of the strongest and most reliable customer support available. If you’re the type that likes to pose your questions to a real human operator, we’re standing by, 24 hours a day, 7 days a week, to give you a hand. If you prefer to pose your queries in a different manner, but with the same level of responsiveness, Domain.com also offers you the ability to live chat with customer service through the chat feature built into their website. Regardless of your preferred method of communication, Domain.com has an option for you. What do I need to transfer to domain.com? There are four things that need to happen to facilitate a successful transfer to Domain.com. Contact your current provider in person in order to have your authorization code released to you. Some registrars do this for security purposes. It is standard practice for a domain to be locked for 60 days after it is registered or transferred. During this period, you will be barred from updating the name or company name associated with the domain, changing the registrant email address, or enabling/disabling privacy settings. However, there is an option to opt out of this. By default, this option will not be checked, so if you are planning to transfer the domain, you will need to log in and manually opt out of this 60-day lock. Can domains be altered during transfer? In order to make any changes during this stage of the process, you need to contact the current hosting provider with a request to cancel the transfer. Otherwise, you must simply wait until the transfer process is complete (typically about 5 days) before making the desired changes. To transfer your domain to Domain.com, you will need your authorization code. Here are directions on how to find your authorization code. After you submit your transfer request to Domain.com, we send you an email to confirm your transfer. Within this email, we provide a link to your account so you can log in and enter the authorization code from your current registrar. If your domain is unlocked and the authorization code is correct, your transfer should complete within 5 days, barring and Registrar conflicts. At times, current registrars send emails to confirm registrar transfers. If you receive an email confirmation from your current registrar, please approve the transfer and your domain should transfer immediately to Domain.com. If you have any questions during this process, please contact our Transfer Specialists at 800-403-3568. Transferring a domain name to Domain.com does not have to be a time-consuming affair. Our goal is to make it as painless as possible. You can save yourself time and hassle by adhering to the recommendations outlined above and assisting your buyer with their responsibilities throughout the process. Keep in mind that you always want to protect yourself from liability. Once the process is complete, be sure to conduct the transfer with this security in mind to ensure you receive the funds you’re due. If you do it right, your domain name transfer to Domain.com should go off without a hitch!